I’ve known all along that this was going to be one of the most extraordinary days of the 2016 trip. The morning was as bright and sunny as an August morning can be during a southern winter and was a good start of what turned out to be a highly exciting botanizing day trip to the Robertson Karoo. We met in the vicinity of Worcester and it didn’t take us five minutes to start discussing pelargoniums. With Andrej ever patiently at the wheel, we chatted for quite a while about Bettie’s five recently published new species in the Hoarea section . A significant addition to the numerous species she has described and published in the last three decades: 32 species that nowadays make the section, which is itself – with currently ~80 species – the largest section in the genus Pelargonium. This required travels and hikes all across the Cape, as well as southern Namibia, visits to herbaria across the world, as well as intensive collaboration with landowners and amateur botanists. Her determination and momentum drove research in this section, as well as in the whole genus for the past three decades. We headed towards Robertson as there was new evidence of Hoarea species recently discovered there. This is a very unusual part of the Karoo due to its position in the Breede River valley between the Langeberg and Riversonderend Mountain ranges, and due to its geology: the area that we were heading to is specifically rich in limestone. While such peculiarities are bound to promise unexpected finds, in this case, they could lead to their demise, unfortunately. What a sad end this would be, but let’s return to this a little later. One doesn’t simply go trampling over privately owned veld, obtaining an approval was essential. We called the farmer on the way, to obtain the permission to visit, which was not only generously provided, he also offered to meet us so we wouldn’t get lost on our way. Johan is intensively knowledgeable about his flora. It is reassuring that many landowners particularly in the Cape, are often proponents of nature conservation themselves. Fig. 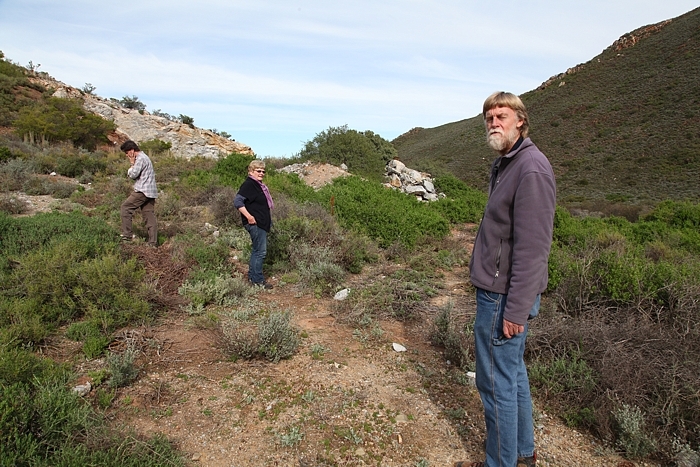 1: Our first stop in the Langeberg range, above an abandoned limestone quarry: Andrej, Bettie and Johan from left to right. We started by venturing deep into the Langeberg mountain range, close to an abandoned limestone quarry and spent some time chatting away (Fig. 1). There wasn’t much to find except for a few ubiquitous P. luteolum, so we headed back towards R60, a busy road linking Worcester with Robertson. In the valley, we looked for other interesting spots to botanize and it didn’t last long to make a fascinating discovery. With its highly unusual flower structure, typically with two, occasionally more fertile stamens, protruding from the flower and twisted such that they brush off pollen on the back of a visiting bee, these miniatures are really quite unique. Rather than depositing pollen on the belly or the head of the visiting insect, as would be the case with the vast majority of other hoareas, the species ‘decided’ to use a different strategy to transport pollen from flower to flower. 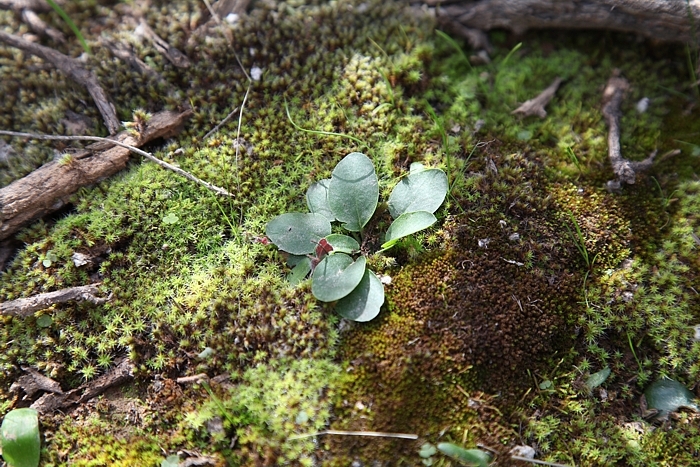 This is shared with only two other hoareas, P. luteum and P. fumariifolium. Fig. 2: The unusual arrangement of fertile stamens make the new hoarea #1 very easily recognizable. Apart from the two conspicuous anterior stamens, one or two more lateral fertile stamens occasionally develop. First discovered by Charles Craib and in 2001 independently by Derek Tribble (London, UK) , it was illustrated in Craib’s monograph ‘Geophytic Pelargoniums: Field and Cultivation Studies of Pelargonium Section Hoarea’ , and sold through the Penrock Nursery as ‘Pelargonium sp. nov. Robertson Karoo’. Craib must have found the species a few years prior to the publication, though it isn’t known when exactly. In any case, the species still needs a name, and I learned from Bettie that this may well have something to do with the tortuous stamens (Fig. 2). In August, the flowers were of course missing, and the small plants could only be found in the shade of shrubs, with rosettes not unlike the common daisy, and certainly not any larger (Fig. 3). Spotting hoareas when not in flower is a bit of a skill, but we were lucky as this was a substantial population and there was not much other, similar, undergrowth. Fig. 3: New hoarea #1, known to cultivation for about 15 years, yet not yet described, with small, ovate, entire to occasionally pinnate leaves. Despite all the excitement, we continued chatting the entire time. It was interesting to learn how Bettie’s interests in the genus developed in the first place. While working with J. J. A. van der Walt, her botany professor and supportive though rather hands-off supervisor doing research on pelargoniums, she became interested in a large group of less well known specimens in the Stellenbosch herbarium that have not been reviewed before. These were the odd pelargoniums with underground tubers, very short stems, rosettes of leaves and flowers that mostly appear only after the leaves have withered. The Hoarea section is well known to probably only a handful of botanists and a small community of amateur botany enthusiasts and growers. Bettie made sense of the unusual herbarium collection, and in the process of doing so, published 14 new species even before the publication of the PhD Thesis at the University of Stellenbosch in 1994 . 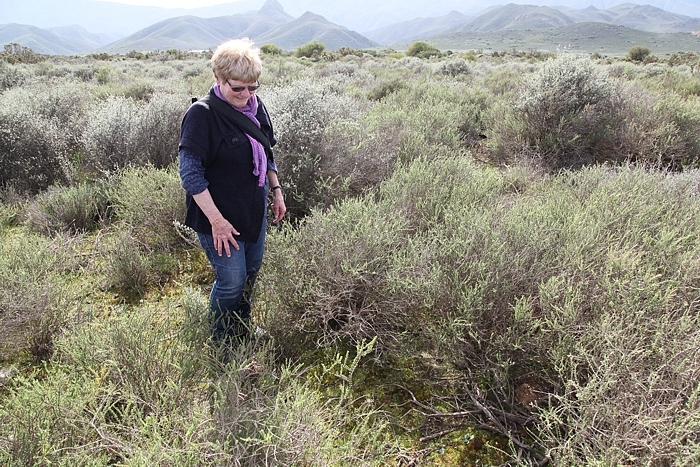 So there we were, looking at the new species and admiring the diversity of flora of Robertson Karoo, when we stumbled upon another unusual plant! How extraordinary: two undescribed species in the same patch of veld. 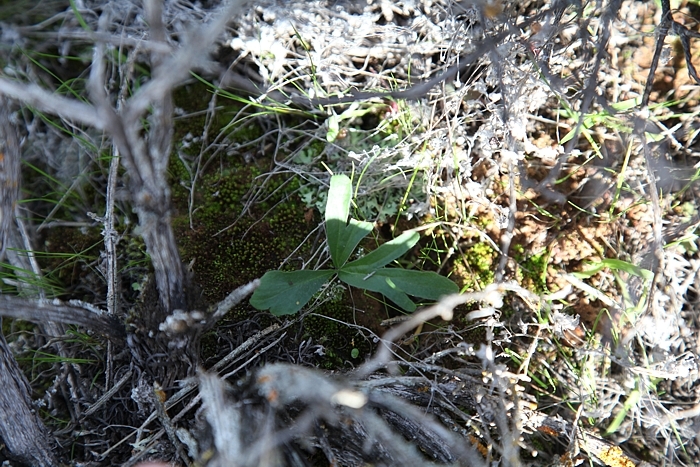 Rather less numerous than the other species, this was a plant of the trifoliolatum group of the Hoarea section, with leaves not unlike young P. luteolum, and so far known from areas closer to Montagu (Fig. 4). This was a moment one doesn’t forget, hopefully bringing Bettie closer to the magic number of 100 Hoarea species. What a lifetime achievement this would be. Fig. 4: New hoarea #2 was rarer in the particular patch we explored, and has palmately compound leaves with three main pinnae. Having spent the entire morning botanizing, it was time to refill the batteries. In a further discussion with Johan we learnt, to our horror, that there is a real and substantial danger that the very spot where the two species are found could be developed into a limestone quarry in the near future. This would obviously bring about the destruction of the two new species, so we shared all the information and documentation we collected. Hopefully this will help to make the case to stop the development plans and protect the precious patch of veld. On the way back, during lunch, the discussion returned to the two and other recently discovered new taxa, their specific characteristics and the substantial and systematic effort that needs to go into their publication. This often takes many years of field work and observation, and a decade can easily whizz by if reasonable distribution data is to be included – many are too hastily critical of the time needed to do this properly. Bettie has no lack of energy to do so, and it would seem to be only fitting to celebrate one of the new plants with the epithet palusiae or perhaps elosii in recognition of Bettie’s career-long effort. Fig. 5: “I hope it’s going to be next year but I can’t promise”, Bettie modestly tells us about the publication of the new species. Gradually, and accompanied by a glass of red wine, the discussion drifted off to history, languages, politics and everything else that friends need to touch base on, even if one only sees each other for half a day every year. Upon our return to Worcester and having said our goodbyes, it took a while for the excitement to wear off. It isn’t every day that one has the privilege to botanize for two undescribed hoareas, and in such company. 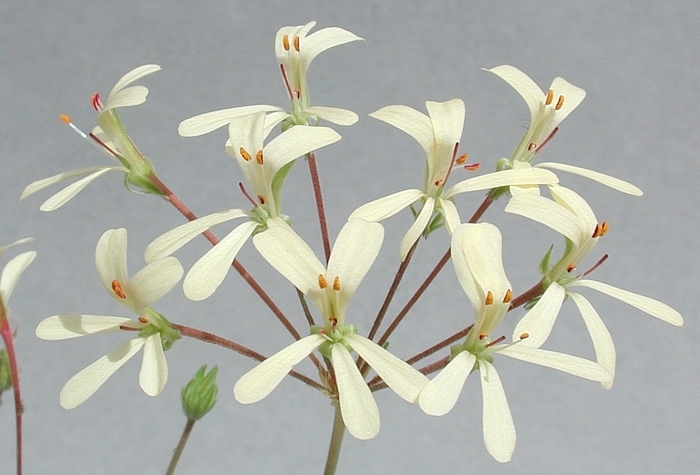 Marais E. M. (2016), Five new species of Pelargonium, section Hoarea (Geraniaceae), from the Western and Northern Cape Provinces of South Africa. South African Journal of Botany 103, 145-155. Tribble D. (2016), Geraniaceae Group News, Autumn, p. 17. Craib C. (2001): Geophytic Pelargoniums: Field and Cultivation Studies of the Section Hoarea. Umdaus Press, 2001, p. 109. Marais E. M. (1994), Taxonomic Studies in Pelargonium, Section Hoarea (Geraniaceae), PhD Thesis, University of Stellenbosch. Cite as: M. Strlič: Botanizing with Bettie Marais, Pelargonium Notes, #2 (2016).